This page is not the most recent documentation, because I've moved the most recent docs to GitHub, where the development snapshot is also hosted. You'll find the most recent documentation there. Then, the disk is LUKS-formatted, which creates a LUKS header. The data of chunk 0 is not lost, it's still kept in memory. 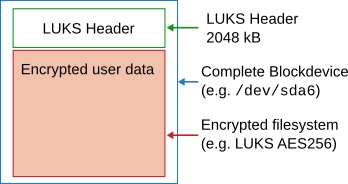 Creating the LUKS header creates a second, "virtual" LUKS disk (i.e. /dev/mapper/luksipc), which is exactly one chunk shorter than the original disk. Every chunk on the virtual disk maps to one chunk on the physical disk, only offset by one chunk (i.e. virtual chunk 0 maps to physical chunk 1, virtual 1 maps to physical 2 and so on). 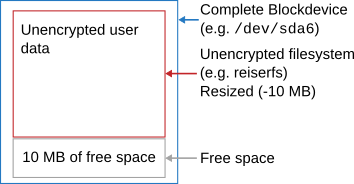 The data that can be read from the virtual device at that point is garbage, because when you read from the LUKS device at that point, dm-crypt will decrypt the unencrypted data of the physical partition. Then, chunk 2 is read in again. Since we have written chunk 0 to the virtual disk, we can reuse the memory space of chunk 0, since that doesn't need to be kept in memory anymore. Now we're all finished and luksipc is done converting the partition to LUKS! Obviously, when you abort the process in the middle of the conversion (meaning your disk is only half-converted), this is a bad situation. While actually the disk is almost completely readable (one half on the unencrypted part, the other on the LUKS device), you will have a very hard time, since you don't know where exactly that cut is. Furthermore, one chunk needs to be kept in memory at all times. This chunk is lost. Therefore, luksipc offers a solution. Should you, for whatever reason, need to abort the process, luksipc will create a "resume.bin" file for you. In this file it will write the current block device position and one chunk of data. Later on, by just calling luksipc with the "--resume" option, the process can be resumed from that point on. Before you attempt to do anything with the device, be warned: You may lose some of your data, even all of it (for example if you put the LUKS device key in /dev/shm and reboot your system before you add another key to the keyring). Power failures are also bad (since you will not have a resume file in that case). Furthermore, luksipc may have bugs that wreak havoc on your data. Also keep in mind that luksipc relies completely on a perfect disk. If your disk has read-problems, it likely will abort somewhere within the middle of the process (most likely also without creating a resume file). If your disk is faulty, get a new one instead of trying to crypt it. And, most importantly: Always have a backup. Now, let's be honest here: You probably don't have a backup. If you had the disk space, you wouldn't have the need to convert data in-place. Or maybe you have one and it's really old. Or the data is not really that important. In any case, please please please do not assume that everything will run smoothly. It may not. You have been warned. I will not be held responsible for any of your actions. That said let me point out that I trusted my software (after thourough testing) enough to let it convert a 1 TB partition without having a backup. This worked nicely. However, your milage may vary. In the package, there is a regression/ subdirectory which performs quite a lot of tests. If you're unsure about how reliable it is or how it works, play around with those first to get a feeling of how it works. If you have any special options that you're passing to luksFormat and you feel that you might run into trouble - for god's sake, please first try it on some loopback block device first to be on the safe side. This version is only for testing or VERY CAREFUL use. [I]: Disk copy completed successfully. Then luksipc it -- and abort right in the middle! WARNING! Resume LUKSification of /dev/loop0 requested. You can see that the performance has decreased a lot (91 MB/s compared to 365 MB/s -- still it is a lot more than most hard disks will be able to utilize). The luksipc HEAD is now on GitHub. I do not use GitHub to track internal development (this I do on my private repository to hide the countless really, really embarassing development bugs), but I will keep it in sync with my private repo once I do a release. So if you have patches, you can submit pull requests via GitHub and I'll try to incorporate them there (whenever I get around to it, which sometimes is embarassingly long to be honest). 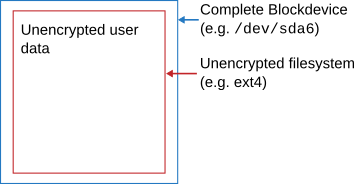 Fixed interpretation of return code of "cryptsetup status" which had changed with more recent cryptsetup versions to reflect the correct error if no such LUKS name was known. Thanks to Eric Murray and Christian Pulvermacher for reporting this issue. Forced chunk size to be 10 MiB instead of the default of 3 MiB. Thanks to John Morrissey for the bug report (under some weird circumstances, the LUKS header apparently can become a lot larger). Fixed a couple of warnings and used stricter compiler flags. Switched to -stc=c11 to be able to use static assertions. Improved error handling for wrong command line parameters (log level integer parsing). Display estimated remaining time until finish. Assert resume file can be written to disk by writing it at very start once and then seeking to its start. Added README file with detailed instructions. Ability to convert devices to LUKS format without having to copy the contained data over.